This finely peated Single Malt is the flagship of the Hidden Malts, together with Clynelish, Glen Elgin and Glen Ord. Its Gaelic name is to be pronounced « Caool-ila », meaning "Sound of Islay". The distillery is located in a small inlet near Port Askaig. This might be one of the wildest regions on the Scottish Western Coast. Its Single Malt is altogether balanced and subtle, iodized and peated, with notes of olive oil, almonds and citrus fruits rising from the nose and the palate. 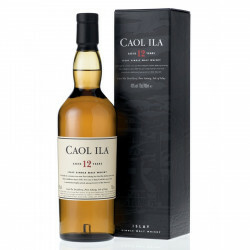 Caol Ila is greatly appreciated by peated whisky lovers. Nose: peated on the first inhalations (heavy peat), iodized and smoked, evolving onto milky notes of almonds, tangy candies, ashes and liquorice. Mouth: oily and slightly medicinal, reveals new layers of smoke and fruits (dried fruits). Finish: floral and herbaceous, evocative of smoky malted barley and silky notes of praline and moka. Overall sensation of freshness. As appetizer, a black olive tapenade magnifies the flavours of this malt.